GlenDronach Distillery possesses a long past. This fact is not in and of itself special. Lots of distilleries go back a ways. But there is something special about a malt that stands on tradition’s shoulders. Founded in 1826, it wasn’t until 1968 that the distillery released a single malt under its own name. In recent times the Distillery came under the ownership of BenRiach in 2008. BenRiach claims that it wishes to make no alterations to DNA of this dram. As of 2016, GlenDronach, BenRiach, and Glenglassaugh are now owned by the Brown-Forman Corporation, a mega corporation with American powerhouse labels such as Jack Daniels, Old Forester, and Woodford Reserve to name a few. Some will speculate whether this is a good or bad thing; that is not the purpose of this post. 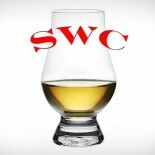 We are here to discuss GlenDronach 12 and whether it is worthy of your hard-earned dollar. GlenDronach 12 is aged for a minimum of 12 years in Pedro Ximenez and Oloroso sherry casks. This is a far different technique of a lot sherried whiskies which only live in a sherry cask for a short time at the tail end of their barrel period. We had four regular members and one guest sample this, and we all agreed the sherry profile on this whiskey was very different from the typical sherry. Most notable was the dominant note of cherry instead of the expected raisin. Beyond that, the nose and taste of this whiskey had a somewhat muted profile. Not necessarily bad, but definitely not bold or bright on the tongue. Everyone quite enjoyed the dram save one aspect. The finish was almost non-existent. Nose – Cherry, fig, grainy, earthy notes, chocolate, brown sugar. Taste – Chocolate, cherry, light salt, light tobacco, light coffee, briny. Finish – Short, almost non-existent. Little notes of the taste carry over here. This review was written by Founding member Ian Fallon.